The HIPAA law requires HIPAA Security policies and procedures manual should be created by healthcare organizations and its business associates. The final HIPAA Security rule, HITECH act and Omnibus rule of 2013 requires companies to apply the security requirements of the law — and then train their employees on the use of these policies and procedures in their day-to-day jobs. American Recovery and Reinvestment Act of 2009 (ARRA)’s HITECH act and Omnibus rule of 2013 requires business associates & sub-business associates to create HIPAA policies comply with security rule and meet risk analysis requirements. HIPAA rule has very specific requirements with regard to creating, implementing, or changing policies and procedures. 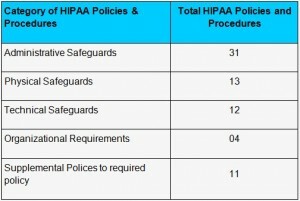 Why Create HIPAA Information Security Policies and Procedures Manual? Developing or revising your organization’s security policies and procedures is a major task that takes time and attention to detail. Each policy must specifically reflect the Security regulations’ complex requirements, yet be worded simply enough to be understood and applied across the entire organization. Each security policy must set the foundation for the individual departmental procedures needed to support and implement the policy. Can you meet the challenge of creating enterprise-wide HIPAA Security compliance policy? We have helped develop over 71 HIPAA Information Security Policy Templates which can help your company become HIPAA security compliant. Our template suite can help you with any aspect of the HIPAA Security Compliance and HIPAA Security Rule while remaining flexible enough to be customized to your business needs. In all our work, our objective was to ensure compliance with HIPAA Security regulations. For example, the Security Rule provision of “scalability” requires that policies should be able to be changed to fit the needs of the entity that uses them. We based our templates on HIPAA requirements, NIST standards, and the best security practices. All of our templates are here to help you build the foundation of your HIPAA security compliance and security plans. These policies are set up to completely fulfill the 2009 updates to the HIPAA and HITECH act, new requirements of Omnibus Rule (2013). Not only have they been established on the best industry practices, but they were created by HIPAA compliance officer with practical knowledge of HIPAA compliance, security experts with healthcare experience. 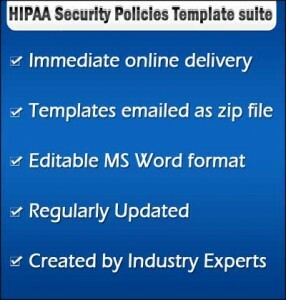 Our HIPAA security policies and procedure templates are ideally suited for covered entities, business associates, and sub vendors. The HITECH act required all Business Associates to be HIPAA compliant. We can help you do that. To grow your client base, you’ll need to prove that you want to surpass the HIPAA requirements, not just scrape by. When business associates use our templates to build better business practices, they encourage their clients to have the confidence in the way the company is run. 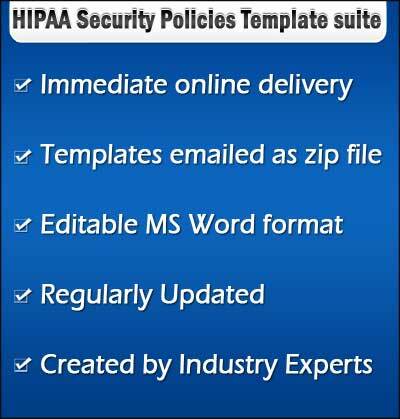 Our HIPAA Security Policy Templates do not function as a completed policy procedure for your company. We provide the Template Suite with the idea that you will use them as a spring board to create quality, HIPAA security compliance procedures. The templates do hit all of the HIPAA guidelines, but remain flexible, allowing you to model your security plan after the templates we provide. Because you will make changes to our policy procedure, Supremus Group cannot and does not assume any legal liability for the final Security Policy and Procedure your company develops. The aforementioned flexibility is available because of the way we format our templates. You will receive the template suite in a zip file via email, with the templates in MS Word document. This allows modifications to be made to the template as best fit your company’s unique needs. 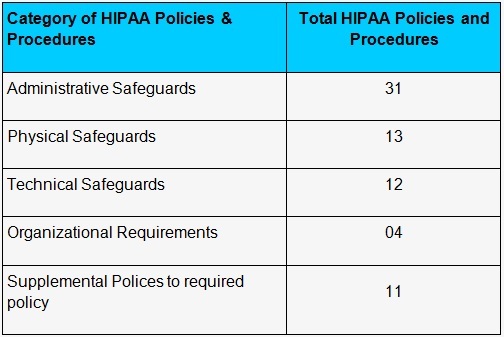 HIPAA Information Security Policies and Procedure Templates – HIPAA rule has very specific requirements with regard to creating, implementing, or changing Policies and Procedures.